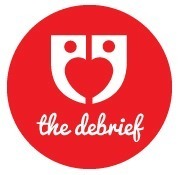 Dorise Gruber is a 29-year-old college advisor, music lover and inadvertent serial dater who presents to us today her analysis of 125 first dates. I blame the Boston Globe column “Dinner with Cupid.” A year ago, my mid-40s male boss, happily married with kids, balked at what he considered to be absurd—a female participant graded her date a “B+” but concluded she would not be interested in a second date. With this statement I jumped down the rabbit hole. Over 100 first dates? Could such an astronomical number really be true? I’ve been in two long-term relationships, the last of which ended after cohabiting nearly five years ago. I’d given up a good thing in search of the right thing, but hadn’t anticipated that in a pool of so many handsome, educated, diverse, and accomplished men I’d have such a hard time finding the right fit. 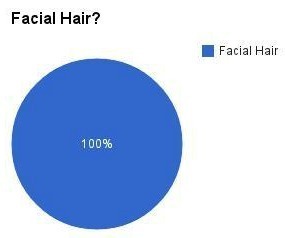 I decided it was time to seek answers, so I set out to collect some data. I scoured my phone (I rarely delete numbers) and wrote down every man I could remember going out with since my last relationship. The criterion for this was strict: actual dates only. No hook-ups, no stand-ups, and no dates discussed without follow-through. They needed to be planned in advance (even if only day-of), and while questionable friendly hanging out wouldn’t count, online-dating requests to “hang out” counted. The +/- indicated a separate sentiment: Did I want to go out with him again, didn’t I, or wasn’t I sure? 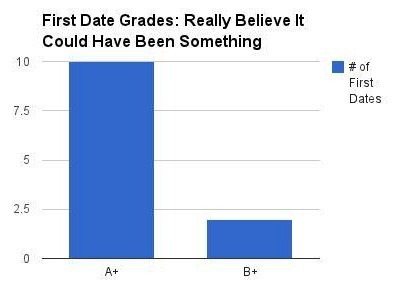 A C+ could actually be more promising than a B- on my grading system; a “meh” date where I was interested in a second go versus a solid date lacking chemistry. The grading actually skewed better than I’d anticipated. After all, I’ve never claimed to be a victim—perhaps just an incompatibility magnet. Still, I wondered how the most worthwhile dates might compare, and consequently generated a separate classification: “Really Believed It Could Have Been Something.” Of 125 dates, that honor only went to 12 guys, or 10 percent of the men I dated. It would probably do me some good to stick to the Tribe. Only 47 percent of the men I’ve gone out with were, at least in part, Jewish, but of the top 12, 75 percent were Jews. Of 125, 53 percent of the Jews had “+” grades, compared to only 32 percent of non-Jews. This makes perfect sense within the context of my past break-ups—religion always winds up mattering, even when I don’t want it to. If a first date doesn’t get an A+ or a B+ grade, it’s probably not worth going on a second date, though it might be worth being friends. Don’t knock online dating, since it can still account for some of the most stellar picks. Be a bit choosier from the outset, but be flexible where you can—sometimes you’ll be surprised. You can still feel real chemistry with someone from the Internet, but you can’t force it. If you’re spending the date trying to decide if you feel chemistry, you probably don’t. Age is not necessarily indicative of interest—the age range of the top 12 is the same age range of the 125. 12 guys (10 percent of 125) also got A+ grades but didn’t have the designation of “Really…Something,” perhaps because these wonderful first dates ran natural courses, and there is closure in their endings. This is not in the charts, but nine of the “Really…Something” 12 (75 percent), I was the one to initiate contact. For the other 12 A+ first dates that didn’t receive the same designator, eight out of 12 (67 percent) initiated contact—the exact opposite. Apparently I do better if the guy lets me be the initial chaser, so long as he reciprocates once things are under way. There were no “A-” dates or “D+” dates, which is likely a good sign—no totally wonderful date that I wouldn’t have considered giving a second shot, and I’m not a punishment glutton. While there was one solid “D,” it was the second online date I ever went on, and it was bad predominantly because I wasn’t ready to be dating. Beware online dating newbies—they can be a gamble (see previous point). Only 6 percent of 125 dates were at concerts, but 25 percent of the top 12 were at concerts. As a music obsessor that makes perfect sense—if you find someone who shares your passions and the first date engages it, that’s going to leave a strong, positive impression. It is possible to care, and it is possible to know when you legitimately believe in opportunity. It may happen rarely, but if it happens even 10 percent of the time, you know you’re not broken. When you know who you are and what you’re looking for, sometimes you’ve got to separate the wheat from the chaff, but it’s OK to be picky. At least as far as I’m concerned, a little stubble goes a long way. After taking a several-month dating hiatus, these reflections have inspired me to reframe my approach—be a little more discriminating, a little more intentional. I’m not interested in No. 126; I’m interested in something meaningful. For now, unless any of you strapping bearded Jewish lads want to come catch a show with me, you’ll find me out on the town—not on the prowl!